No matter what we could have read on the internet Riccardo Tisci delivered a damn good collection full of what he really cares for: Gothic that always comes with a sense of romance twisted with figures of mexicana gangsta called chola. Modern myths meet blackness and heavy brocade outfits inspired by those from the Victorian age. This Autumn Winter 15 collection was like Vanessa Ives (the character played by Eva green in the horror TV show Penny Dreadful) trapped in a strange and mysterious bar full of video games, the kind of bar where you could find the characters of Robert Rodriguez's From Dusk Till Dawn. If you can picture that, you are somehow entering the AW15 underworld of Givenchy. Riccardo has brought again his sense of gothic-romantic, a definition of beauty that has become the trademark of Givenchy. We've already known this trick or gimmick. He is obviously good at it so why not resorting to his best hits and pushing them to a new level of extravagance, of drama, of high-end sophistication? Why not listening to his gang (that's how he calls his friends) and to his customers and giving them what they want? A bit of modern myths from mexicana with a hint of victoriana women always in black because it's the only color they feel most confident in. They won't mind opting for other stronger color such as dark blue, red or purple. 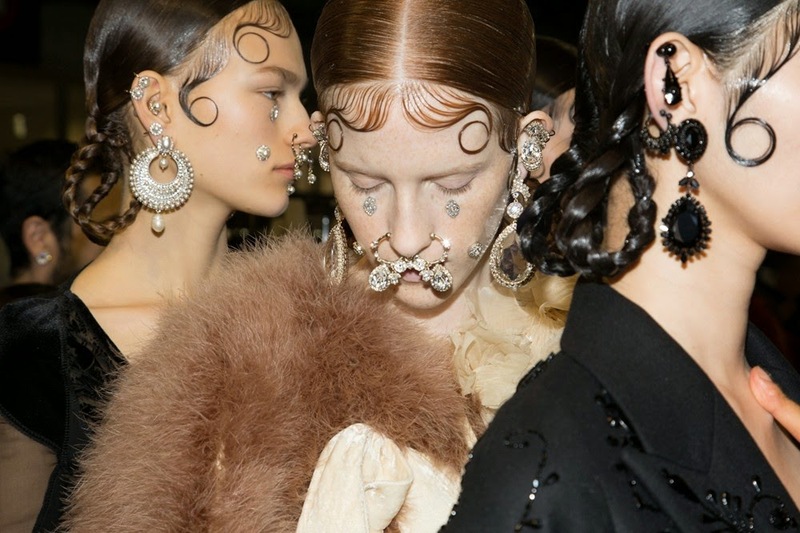 The AW15 Givenchy woman is certainly afraid of the notion of emptiness as she won't go out without her embellished make-up and toilettes made out of pearls and other glittering fabrics. She is a real woman that woke up like this, empowered by belted pieces no matter the time of the day from crysta- embroidered long dresses to tail suits. She has no inhibitions and she is completely free to live and do what she really wants, assuming her femininity through transparent silks and laces. She's fearless like Riccardo because that's where his creativity is coming. No matter what people may think of Riccardo & Givenchy, it's a long and happy couple that will last for an undefined period.